The e-Government Customer Perception Survey is conducted annually by the Ministry of Finance and Government Technology Agency of Singapore (GovTech) to assess the level of receptivity towards e-Government initiatives among the general public; and to identify areas for further improvement. The survey was conducted in Apr to May 2013 for the reporting period of FY2012 (i.e. 1 April 2012 to 31 March 2013). The survey aims to determine the level of satisfaction in using Government electronic and mobile services and identify area for improvement. 1,213 respondents, representative of the total demographic population above the age of 15, were surveyed. Data collection was done via face-to-face interviews. 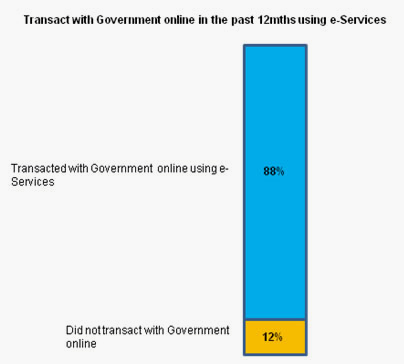 Almost 9 out of 10 (88%) who visited Government websites chose to transact with Government electronically via online services in the past 12 months of the financial year. The remaining 12% who did not transact using Government online electronic services primarily don’t find the need or they prefer human contact/assistance in completing their transaction. To help this group of users, the Government has put in place a network of easily accessible CitizenConnect centres. They can go to any CitizenConnect centre for free internet access or complimentary help to transact electronically with the Government. There are currently 27 Citizen Connect centres located throughout Singapore. 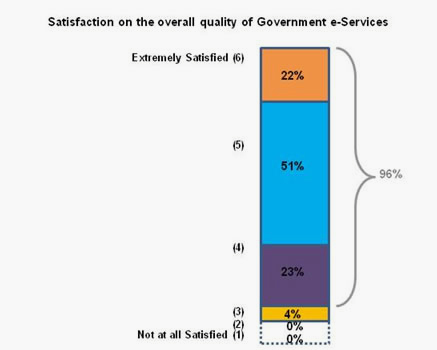 More than 9 out of 10 users (96%) were satisfied with the quality of Government electronic services, of which, 73% gave a rating of 5 and above. 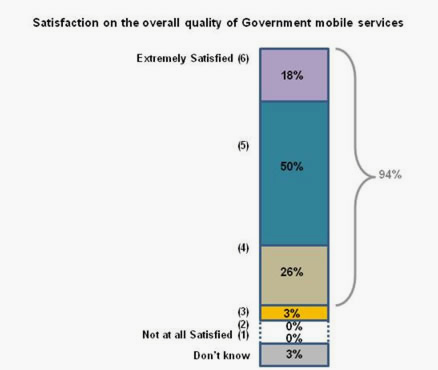 Satisfaction on overall quality of Government mobile services. More than 9 out of 10 users (94%) were satisfied with the quality of Government mobile services, of which, 68% gave a rating of 5 and above.